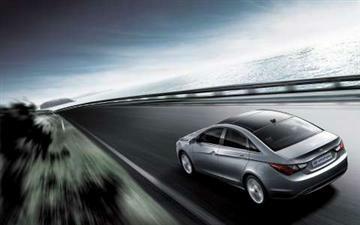 Hyundai Motor Company Australia will launch the new i45, an all-new mid-sized sedan, in the 2nd quarter of 2010. The i45 represents a modern approach to the traditional mid-size sedan segment incorporating Hyundai’s new ‘fluidic sculpture’ design and luxury features, combined with Hyundai’s value proposition. In the U.S., the all-new mid-sized sedan, built at Hyundai Motor Manufacturing Alabama, is setting new standards in the mid-size car category, with best-in-class fuel economy rating thanks to the new 2.4 litre Petrol Direct Injection (GDI) four-cylinder engine, new six-speed manual and automatic transmissions and highly refined aerodynamics. Australian bound i45s will be produced in South Korea.